For old analog synth users a happy accident occurred when increasing the resonance to the max. The cool and crazy result of this left a lot of synth lovers angry and confused, but the adventurous among us saw it as an opportunity to experiment and create weird and wonderful sounds! 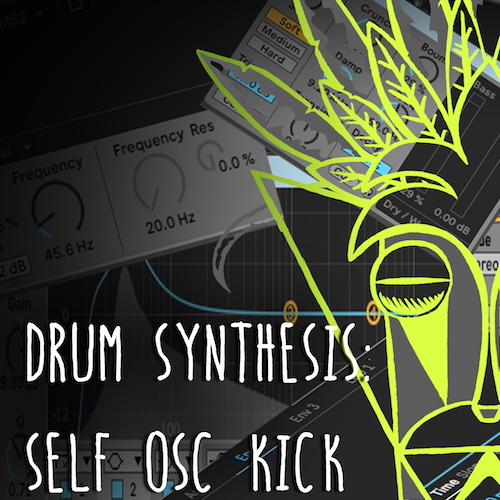 In this ‘Drum Synthesis’ series blog post we are going to use this “mistake” to build a kick drum, without even using an oscillator or sample. Start of by switching off the 2 oscillators and sub. Now, the sound for the kick is going to be generated by the filter’s self oscillation. On the filter, set it to the MS2 filter circuit and low pass. From there, boost the resonance amount to max (125%), lower the frequency cutoff to 45Hz and, of course, boost the filter drive to beef up the sound. At this point there will be very little sound, because the filter is so low. Now, we want to use an envelope to add a boost to the filter cutoff which will, in turn, add a pitch bend to the sound. In the envelope, set the peak to 72% (this controls the amount the pitch goes up), decay to 110ms (this controls how much pitch bend there is) and, lastly, the release to 655ms. Now let's move into the amp envelope. Set the decay to 800ms, sustain to 0% and release to 655ms. Now we have the foundation of our kick, we just need to lower the volume to -13dB and, from there, add some effects. The first effect to be added is the EQ8. Cut the low end, then boost the root frequency. And, last but not least, let’s add the amazing drum buss to add some extra weight to the kick. So, set the drive to 35%, crunch to 42% and the boom to 29% and congratulations, you’ve created your kick! 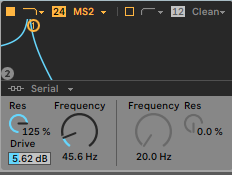 As you can see you don’t even need to have the oscillators switched on to make a sound in Ableton’s Wavetable (which is one of the reasons why we love it)! 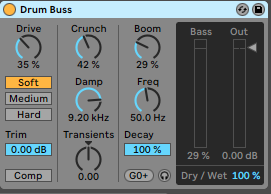 Why not try experimenting with the preset by pitching the sound up and adding some more modulation. Have fun!